Konami of Europe has announced it is bringing its phenomenally successful Yu-Gi-Oh! franchise to the Xbox video game system from Microsoft. Entitled Yu-Gi-Oh! 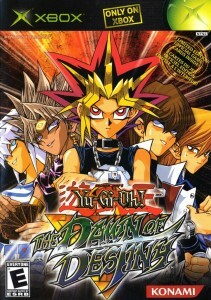 The Dawn of Destiny, the game will be released in November and is a detailed recreation of the intricacies of the Yu-Gi-Oh! universe. Yu-Gi-Oh! The Dawn of Destiny is a faithful recreation of the trading card game to date and features all the traps, monsters and duelling of the card series and transfers it to a 3D play area. Every rule has been incorporated in the Xbox game, while over 1,000 of the latest trading cards have been transferred to The Dawn of Destiny, while the many spells and creatures are effortlessly brought to life via breath-taking combat sequences. Consistent with the Yu-Gi-Oh! franchise, The Dawn of Destiny sees the player using all their skill to use their hand of cards to best advantage. The basic aim of the game is to seize all of the opponent’s cards and this is effected by laying traps, casting spells and sending armies of creatures into battle. Each card is allocated specific strengths and weaknesses, and players must put these to good use to overthrow opposing adversaries. Yu-Gi-Oh! The Dawn of Destiny, however, also ups the ante massively and allows Xbox duellists to construct three different decks of cards, allowing the use of multiple attack and defensive combinations thus creating incredibly visual and complex battle scenarios. Similarly, the game also features all-new duel modes, facilitated by the Xbox’s System Link cable. This allows players to link to a number of consoles together for two or three-player tournaments, with the player who defeats all three opponents in a row to add new cards to their collection declared the winner.